Not much is new here. We exploit this the same was we did the first two except that we have a null character (ctrl @). I want to point out one thing that I didn't mention on my previous posts. The address of cookie and buf are printed out so we don't really need to "guess" where they are on the stack. I ignored this before, because in real programs, the address values are rarely printed out. Gera's challenge #2 is exactly the same as the first one other than the cookie we need to write. What makes this interesting is that the characters are not "printable" (they don't have a symbolic representation. 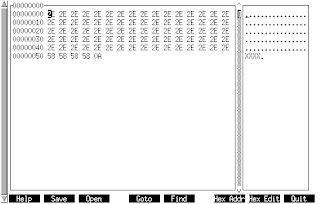 Take a file similar the original one and use a hex editor, like hexcurse(1), to manually modify it. Gera has a series of "challenges" designed to help teach people the basics of exploitation. The goal is to provide some input to the program to get it to output you win!" The gets() function cannot be used securely. Because of its lack of bounds checking, and the inability for the calling program to reliably determine the length of the next incoming line, the use of this function enables malicious users to arbitrarily change a running program's functionality through a buffer overflow attack. Then we have a check to see if cookie is equal to some value. We can convert this value from an integer to printable ascii(7) characters. 0x41is A, 0x42 is B, etc. So we want to set the cookie to "ABCD". There is one little gotcha: The machine I'm using (and most you probably are) is little endian so we actually need to reverse the order of our text. What should we actually do? No serious programmer uses gets anymore and real exploits are likely to be harder to create due to OpenBSD's w^x protection, gcc's stack protector, and good coding habits. This was just an intro to the art of exploitation. I plan on following with either the next warming up to the stack challenge or the "esoteric" format string vulnerabilities. Update 12/26/10 clarified the goal of the exploit. Explained what "jot" does. One old trick to bypass simple domain based filters was to use Google translate on the domain and go from English to English (or the native language to the native language - whatever it might be). "Translation from English into English is not supported." When I tried with other languages I got similar errors. Translating to other languages works as usual. Luckily this trick is not really needed as there are thousands of available proxies or one could just make their own. FreeBSD has a nice feature that will signal a process with SIG-INFO when you press Ctrl-T and will tell you some other interesting data about the process such as the load of the CPU, current command that is being run, and the kernel state the process is in (the wchan keyword in ps(1)). biord: block on io read. zombie: a process died but its parent did not wait(2) for it. There are other syscalls that are similar to the ones mentioned above (such as readv(2) instead of read(2), and waitpid(2) instead of wait(2)) which will end up with the same wchans. Thank you irc://irc.efnet.org/nox--- for helping me figure out what all of these mean. I will try to keep this list up-to-date as I find out about more of them. Update 9/21/10: removed "CPU0" state - it doesn't show up in the siginfo output - only in the top output. Update 10/7/10: added wdrain, swread - I have a /lot/ more to add. Story here One question: Can the account that generated the warning also dismiss it? Cognitive Daily, one of the best physcology blogs around, announced they will no longer be posting anything new. I've been reading Cognitive Daily since I was in high school and I'm very saddened to see it go. One way to avoid Google getting "too smart" about your search query is to purposely misspell words. Sometimes I've found more relevant results when I do that. The misspelling has to be close to the original word though. This creates an optional attribute "stub" that is a string which could either be "true" or "false" and is by default "false". That wasn't too hard to figure out. The harder part was getting my XSLT file to only display non-stub questions. My first try was <xsl:if test="@stub != 'false'"> (I used != because of the default). This however never showed any of my questions. It turns out that != doesn't work when an element doesn't exist. After asking around on IRC <xsl:if test="not(@stub = 'true')"> appears to be the correct way to do things.